Funyo is one of our newest creations, intended for parents. 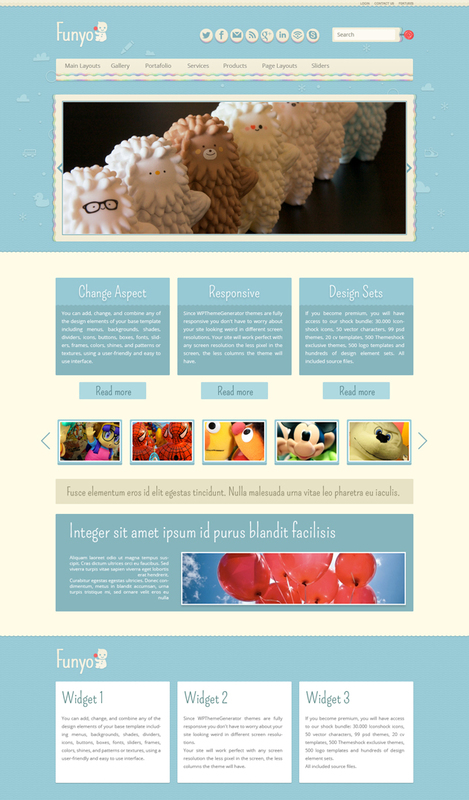 With this premium theme, you can create a beautiful website or blog to show the world how much you love your baby. It has all the necessary elements, like social buttons menus, slider, widgets and more, complemented with awesome curvy typography. 4 people showed their love and said thanks, will you? This is great, once i´ve buy i have full time acces? I have some questions about the wp themes because I do find your website/service a bit confusing. With the themeshock bundle I guess I get all of the themes for one price? Once I upload a theme does it come with a visual editor which can be used in wordpress? Also, I didn’t see any examples of pages that can be created apart from the homepage? Do the themes come with shortcodes, I couldn’t find a tab or accordion shortcode? Yes, you receive all themes for that price. There are visual customization features once they are installed. There are multiple different page layouts, you’ll be able to swap them once you install the theme.